The September/October issue of Seattle Maison magazine is so full of great content.!! The Autumn-inspired articles are plentiful this issue. Discover uniquely beautiful ways to store your bike during the rainier months so you can still enjoy it. Or plan a day trip to see the Fall foliage in all its glory while getting some exercise. And you can get the scoop on the neighborhood Halloween fun around the greater Seattle area. The real estate-based articles are full of helpful information. Get tips on how to choose the right neighborhood for your lifestyle. Learn more about Homepolish, a service that pairs consumers with budget-friendly designers. See what’s happening in the current King County housing market with timely statistics. 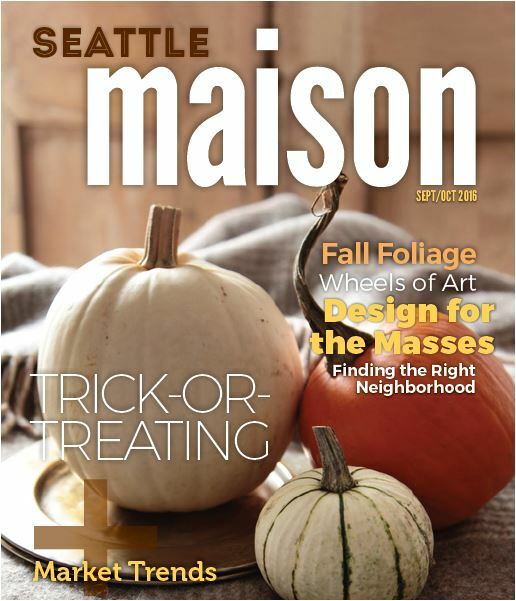 I think you will love this festively Fall issue of Seattle Maison as much as I do. If you would like to be the first to read Seattle Maison by having the next issue sent directly to your in box, email me at Kathryn@Windermere.com or comment on this blog post and I will add you to my mailing list.